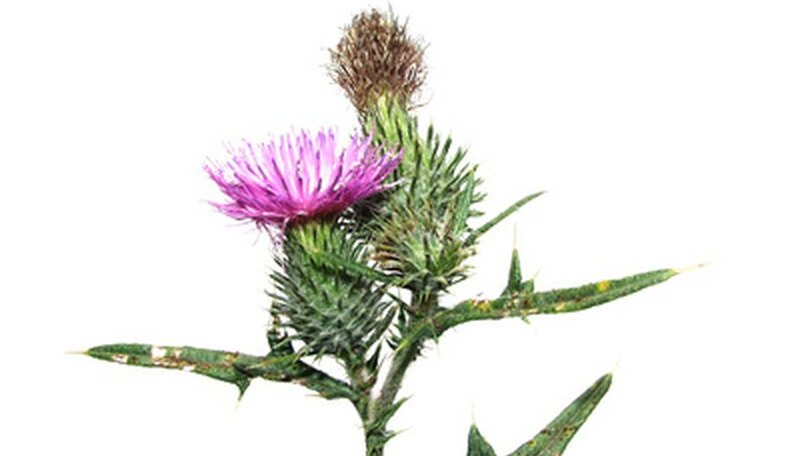 Thistle, although a national heraldic symbol of Scotland, is branded as invasive or noxious by most of the U.S. Getting rid of these distinctive pink to purple-flowered plants can involve a campaign that takes years for perennial varieties. Although annual and biennial thistles can be controlled more easily, they must be stopped before they let loose the hundreds of seeds they produce. Whatever the variety, you’ll encounter more success if you get started early. Grow a thick lawn to discourage thistle growth; water deeply and fertilize to help grass keep roots healthy. Pull annual and biennial (plumeless, musk and bull) thistles as they form rosettes in summer before annual plants grow tall branches, or “bolt.” Once plants have bolted, they will quickly form flowers and set seed; if this happens, decapitate plants before they have a chance to bloom. Mow lawns frequently to prevent perennial (Canada, Flodman or wavyleaf) thistles from “bolting” (the phase of growth that raises flower heads and sets seeds). Keeping perennial thistles limited to growth as ground-hugging rosettes weakens them over time. Perennial thistle roots are often deep and difficult to completely pull. A badly infested lawn may need to be cultivated with a rotary tiller, cleared of plants and re-seeded. Apply glyphosate to the ends of roots when pulling annual thistles or immediately after mowing other thistles. A systemic herbicide will enter wounds and kill the remaining roots. Late fall application of glyphosate also acts as a “pre-emergent”herbicide, preventing germination of biennial seed. Contact your local state university extension to ask about biological controls if your interest is organic thistle control beyond digging and mowing. The Midwest Organic and Sustainable Education Service reports research has investigated organic controls such as an up to 20 percent solution of vinegar, the Pseudomonas syringae pv. Tagetis (Pst) thistle parasite and the use of bugs such as the Canada Thistle Stem Weevil (Ceutorhynchus litura) and Thistle Defoliating Beetle (Cassida rubiginosa). A war against thistles is often a war of attrition. By keeping thistles from bolting and using herbicides late in the season when recovery is difficult, perennial and biennial thistles are weakened. Several years of attack may be necessary to get rid of some perennial plants. In the meantime, improve the rest of your lawn so that lawn grass plants are strong enough to crowd out thistle seeds that will inevitably drift in from plants in adjoining yards or distant fields. If you don't seem to be able to grow anything but thistles well, contact your local state university extension service for a soil test. You may be able to do something as simple as improve soil fertility with a top dressing of manure or alter the pH with lime or sulfur to grow a healthier lawn. Wear heavy gloves and leather shoes when handling thistles. Their spiny "prickles" are almost impossible to remove from skin and fabrics and can irritate for weeks. Over-fertilizing lawns can burn out the grass but energize thistles. Always follow directions on fertilizer or herbicide packaging for usage and rate of application.